I have always wanted to try Fair Isle knitting. The other evening I was surfing the internet and found a pattern for a Miniature Knit Christmas Stocking. I saved the pattern in my computer, and then showed it to my daughter who is still here for Christmas break. We both kept thinking about the pattern, so the next day we decided to take some Koigu yarn and give it a try even though neither of us needed to start anything new. Really it wasn't quite that simple. The pattern on the internet was knit as a flat piece and then seamed up the back with the heel knit in two pieces. We decided that since we have both knit socks (regular people sized) that we could change the pattern and knit this miniature stocking in the round. You've heard of a quilt-as-you-go project. Well, this project was a knit-as-you-go. We just started knitting and then stopped and brainstormed along the way. After this little project, I have quite a healthy respect for Fair Isle knitters. Their end product is always so beautiful and professional looking. I found it to be kind of fiddly because to do Fair Isle the correct way you have to knit one color with your left hand and the other with your right. So you have to be somewhat adept at continental as well as English knitting. Now having said all that, I like the finished product and we have plans to do a second stocking. DD just made notes as we knit last night. She is rewriting the pattern and reworking the chart now. Then we will do a second stocking .My stocking is the green one; DD made the blue one. I can see some mistakes in my stocking, but I think they look cute on the tree anyway. This is one of my Christmas presents, a Droid Incredible phone. It definitely lives up to its name and does not disappoint. I haven't had a new cell phone for a bit over 3 years, and you can imagine how technology has changed in that amount of time. This phone is like carrying a little computer in your purse. When you hear those commercials on radio and TV that say, "There's an app for that". well they are right. You will notice that I found the Starbucks app. It tracks my location and will map the nearest several Starbucks to where I am located......priceless. It also has an app for a knitting counter. My real knitting counter is keeping track of the heel I am turning on a pair of worsted weight socks right now so this one came in handy. There is a voice recorder so you can dictate things to yourself that you can't take the time to write at the moment. There are free books you can download and read on the phone. Right now I'm reading Pride and Prejudice. I can check e-mail and surf the internet. And, I can even read blogs on this phone. ﻿I'm still learning what this will do, but so far I've found lots of things that will make life easier and more convenient. I also got a couple of yarn and quilty things for Christmas, too. I'll post them tomorrow after I take photos of them. I've done some sewing and knitting, but mostly have just been enjoying spending time with family. Hope you all had a nice Christmas, too!!! Merry Christmas to all of my followers,subscribers, and visitors. Thank you for stopping by to visit my blog. I really enjoy all of your visits and comments. I hope you have had a wonderful holiday. Here are a few of the photos of Christmas at my house this year. These are our dinner napkins. I bought these at the Kitchen Cupboard in Shipshewana, Indiana. My Mom made these ornaments many years ago. She loved Christmas. She passed away in 1996, but she is here with me every year through happy memories. This is the dining room tree. The poinsetta that my hubby bought me. The tree in our study. The family room tree. This is the one with all of the sentimental ornaments - the ones my Mom made, ornaments from friends, and the ones that the kids made in school. I've restarted the stitcheries on the Christmas Hearts tablecloth, and here is the first one done on point like the other one should have been. The heart stitcheries go on the corners of the pieced table cover, and if I hadn't been so anxious to get started on the project and would have studied the pattern a little bit better beforehand, I would have realized that they should have been done on point. I've enjoyed doing some redwork again. These are some of the fabrics that I plan to use in the tablecloth. My camera is one of my favorite quilting tools. I can tell a lot about the value and shading and how fabrics or blocks will look together by taking a photograph and putting it up on my computer screen. I sometimes use a reducing glass, but to get an overall idea of what a project really looks like, I use a photo. That way I can back away from the screen and get a much better idea of what a quilt or fabric grouping look like together. Yesterday I went out to finish a little last minute Christmas shopping. And, since the weather service was predicting somewhere between 3 and 5 inches of snow overnight, that meant a trip to the grocery store. I don't know how it is in other parts of the country or the world, but whenever there is a prediction of snow, we need to go to the grocery and get bread and milk. Now, it doesn't matter whether or not you already have some milk or bread in your refrigerator, you still need to make that one last trip to the grocery store before the storm comes. I think that mindset is left over from those of us who lived through the Blizzard of 1978 here in the midwest. It was frightening to say the least. I have never seen snow drifts so high or heard the wind blow quite the way it did that night. And, according to news reports the bread and milk quickly disappeared from the grocery shelves. Then I thought that since I had a new pattern, a little stash enhancement was in order. I'm not sure I have seen this many Jo Morton fabrics in one shop before. It was hard to choose, but I did my best. Hope you are all finding some time to stitch!!!! I had this arrangement up on my design wall since before mid November. I tried to arrange the blocks in a trip around the world setting with red and green hourglass blocks in between every block. In a way I like it, but I think it distracts from the signature blocks. I think the red and green hourglass blocks are a bit "in your face". I've lived with this arrangement for almost a month now, and I'm just not sure I like it all that much. I do like the hourglass blocks used as a border (or maybe inner border). As they turn the corner they change from looking like a red square in a square to a green square in a square. So some of those blocks would still be used. Here is another arrangement with a tone on tone white as sashing. The blocks were in no particular order. I wasn't exactly sure about the plain white sashing either??? Then I tried to do something between a cross and a star. But without about the same number of each color (and there are quite a few blue and black blocks), this wouldn't have worked so .....no! 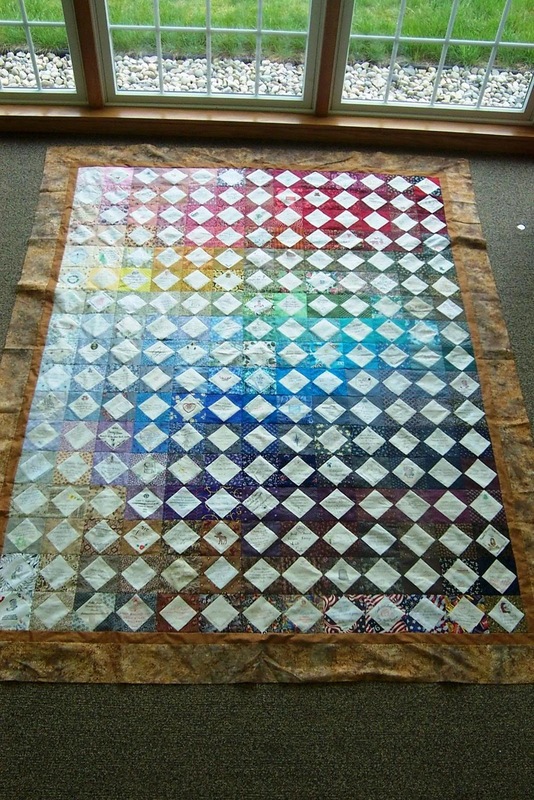 This is how I did my signature quilt from 2002. I did a colorwash look, and I like the way it turned out. I should take a photo now that it has been machine quilted and bound. But, I would like an opinion on the Christmas blocks. 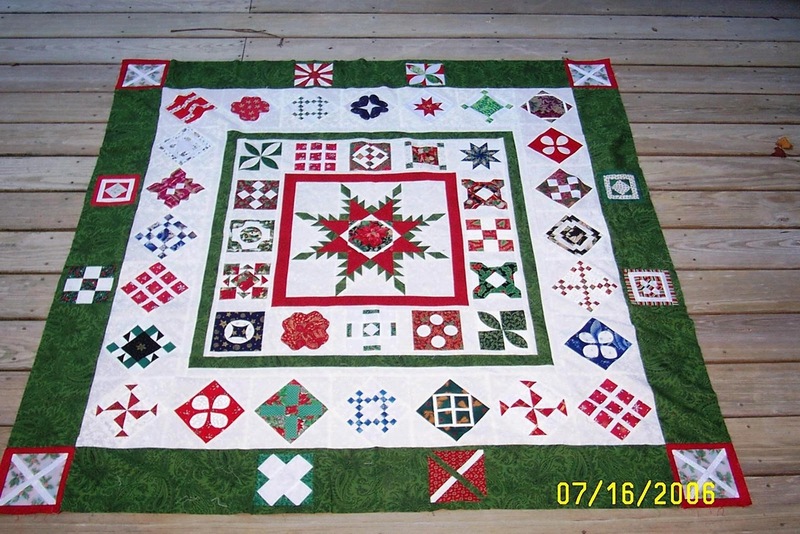 There are only 150 Christmas blocks so the quilt won't be very large with just the blocks. They finish at 4 1/2". So my question to you is, do you like any of the above arrangements or do you have another idea that I could try? I am probably way over-thinking this since this quilt will only be on display for a month out of the year. I welcome any ideas that you might have. Aren't you glad we have quilts to keep us warm in this cold weather? Hope you are all keeping warm and finding some time during this busy season to stitch. One of the first handcrafts I learned as a young girl was embroidery. 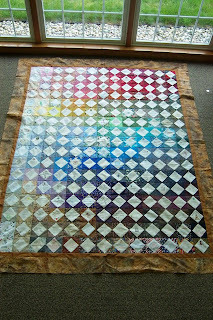 I love looking at all of the quilts and projects out in blogland that combine stitchery and piecing. A few weeks ago, I received the pattern for a Christmas Hearts tablecloth that has both piecing and stitchery from my friend, Roswitha in Germany. Her quilts are beautiful, and she handquilts them as well. 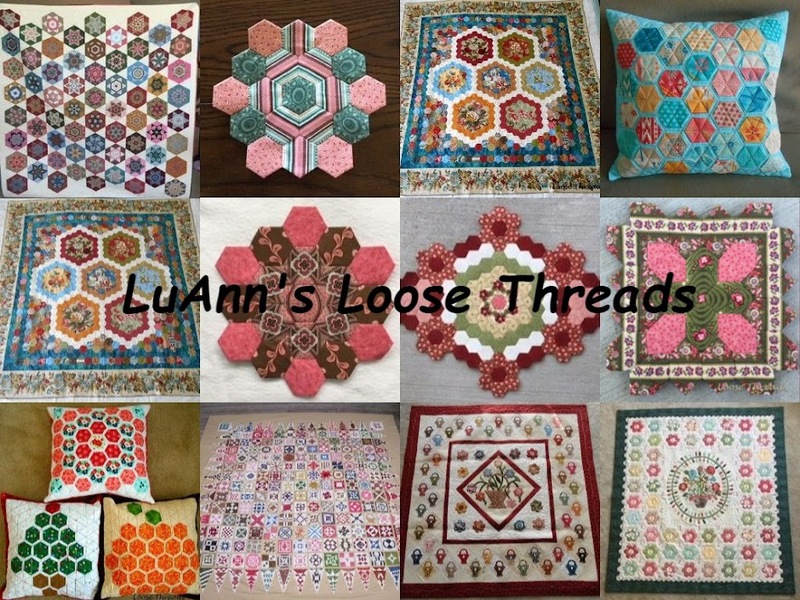 I love going to her blog to look at her quilts. I was excited to get started, so I found my background, traced the design and started stitching. I finished the first stitchery and rinsed away the blue marks and gave the piece a good pressing. Then I took a look at the rest of the pattern so I could do the piecing. I guess I was so anxious to get started on this that I didn't see that the stitchery was to be on point. Roswitha said she had made the same mistake and has made her first stitchery into a cushion. So I will either do that or make a small wall hanging. Hope you are keeping warm and dry and doing some stitching today. This week was a good mail week. I got a Christmas package from my friend, Val, in Canada. I had coffee in my new Canada mug while watching it snow. She made this little sheep bag to hold a small knitting project. There is room for 2 small balls of yarn or one big one. She sent me this yarn another time, and I am just now starting a pair of socks with it. Love this little bag!!! And she sent me a puzzle of the Dear Jane quilt all the way from the Bennington Museum in Vermont. I'm waiting to open this until Christmas is over. And this cute kitty ornament is hanging here on the tree beside me. Thanks Val for a wonderful package. This gorgeous charm pack came from my friend, Sarah in Australia. I don't need to tell you it is Moda. Their fabrics are always just beautiful. I'll make something special with these fabrics. And, she included this card with the cute koala, too. Hello to my new followers as well as those who have been following for awhile. Hope you all are keeping warm today and stitching!!!!!!!! Thanks for stopping by for a visit. 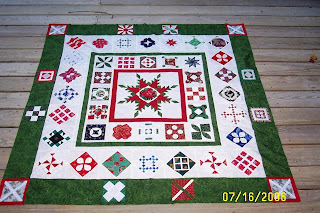 I've been listed in a post over at One More Quilt today called the 12 Days of Christmas. Frances has listed twelve different blogs to show the ways we are getting ready for Christmas this year. I hope you will stop by and pay her a visit today. I've been listed for all of the outside Christmas lights that we decorate with. Since my original post, we have put out another string or two around the back of the house so we now have lights completely around the outside. I listed 8,900 lights when I posted before, but I found out that didn't include the big wreath or the star on the front of the house. So with the extra lights that we put out back, I imagine we are up to 10,000 now. 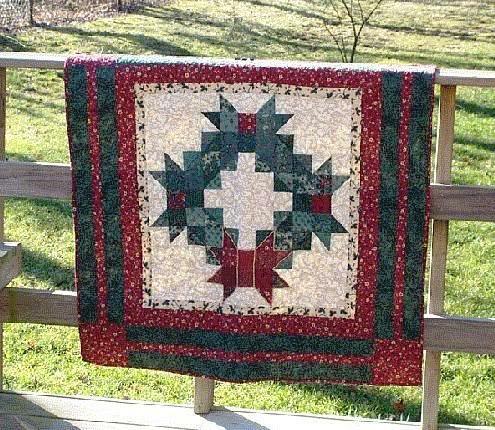 This is one of my Christmas quilts made from blocks from a Dear Jane Christmas swap a few years ago. This wreath hangs at the top of my stairway. I've been doing a little sewing and some knitting here. More on that later. Hope you are enjoying this holiday season!!! Thanks for visiting. On Saturday we went to Purdue University in Lafayette, Indiana, to watch the Purdue Christmas Show. My daughter is 3rd from left. I couldn't record sound from the performance, but here is a short video of their performance on the Lafayette TV station early Friday morning. She is second from left in the video. Enjoy! Hope you are stitching something on this cold, snowy day!!! Here is part 2 of the Roll Roll Cotton Boll Mystery from Bonnie Hunter. Today she published part 3, and it is string piecing 60 8 1/2" blocks with neutrals or fabrics that have a mostly neutral feel to them. I will need to dig deep into my stash to find things that are as interesting as the examples that she had on her web site. I'm going to try really hard to use what I have in my stash. Speaking of my stash, I did a bit of shopping at Lolly's when I was at the Dear Jane retreat up in Shipshewana, Indiana, the week before Thanksgiving. I had some requests to show what I had in my shopping bags. Here are a few of those things. I bought some bricks, stones and roofing. You never know when you are going to need to have some things for a building or a roof, right? I thought they should be in my stash so I bought just a bit of each one. Then there was the Kaffe display. Ahhhh Kaffe. My local quilt shop just started carrying a few bolts of Kaffe, but before this I had to order on line. So it was really nice to be able to handle the fabrics and see them in person and pull them off the shelf to be cut. These are just some that I was sure that I didn't already have. These plus the 4 that Vicki shared with me made a nice addition to my Kaffe collection. Then I had breakfast with Gretchen, one of the local gals that belongs to the Moda club at Lolly's. After we ate, we walked on over to Lolly's, and as I stood there looking at the Kaffe fabrics again, she pulled open a drawer in the cabinet and told me that there were Kaffe fat quarters in there. Well, that was a surprise, and I didn't have these so I grabbed a basket and this is what I ended up with. These were just some things that I saw underneath a display and decided that they would be nice to have. They would go well with my Kaffe fabrics or they would make a nice border. I guess these fall into the "pick me up and buy me" category. You've all found those fabrics. ﻿I'm sort of going back and forth between liking brights and still enjoying my reproduction fabrics. I bought a few more things than this, but need to organize them, and take photos. I really hadn't done a lot of fabric shopping for a long time, so I used this trip to sort of stock up!! When I was at the Dear Jane retreat, Connie and Jeanne asked me if I knew that Bonnie Hunter was starting a new mystery quilt soon called Roll Roll Cotton Boll. I've never done one of her mysteries before, so I decided that since this one was just starting I'd jump in and do it. It was easy enough to do, right? The first step is two inch strips sewn together and then subcut into two inch segments. It would have been easy enough to go to my 2" scrap bin if I had one. I used to have all of my scrap strips separated into 1", 1 1/2", 2", 2 1/2", and 3 1/2". Then I had some 1 3/4" strips and some 4 1/4" squares. I must have had a plan for those, but by the time I ran across them again I had forgotten what it was. One day I decided that they all would take up less room if I dumped them all together. And, it was great. They did take up less room - 4 boxes instead of 6 or 7. And, after all when the time came to find a certain sized strip all I'd have to do is just look and I'd be able to pull them right out. Well let me tell you, after you look at a big box full of jumbled up fabric for awhile it is hard to tell the 1 3/4" from the 2", and by the time you get to the second box even the 2" and 2 1/2" start to look alike. So I ended up going through each box with a ruler to separate all of them back into their own containers again. And, the way the day went there weren't really any pink or green in the 2" bin that would work for this quilt, so I ended up cutting from my stash anyway. This is step 1 all finished. Now for the second step I should be able to go right to the 3 1/2" bin and pull those pink and brown strips right out and start to sew. I'll let you know.....stay tuned. Hope you are finding some time to stitch today.....or to organize your scraps.